Between about 7,500 and 10,000 years ago the Hardaway type evolves into the Palmer and Kirk types. Stemmed points with notching on the sides or corners of the base become the norm. We also see formal scrapers and unifacial tools. During this time human populations were growing, and with more mouths to feed, their approach to gaining their subsistence is thought to have become less focused: they gathered more plants, and killed many different kinds of game instead of following herd animals. The Middle Archaic period sees a continuing shift from passive encouragement to active sowing in agriculture and gardening. The population continued to grow steadily. 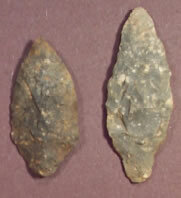 This period is characterized by Morrow Mountain, Guilford, and square stemmed points. In addition, atl-atl weight were used during the Middle Archaic period. By the Late Archaic period, it appears that regional groups were forming and that territories of competing groups were being recognized. The increasing complexity of culture reflects the need for managing threats and risk. This is not to say that these territories were as circumscribed or closely guarded as the borders of modern political entities like towns, counties, and nations. Indeed, there is ample evidence of the movement of ideas and people across the landscape. 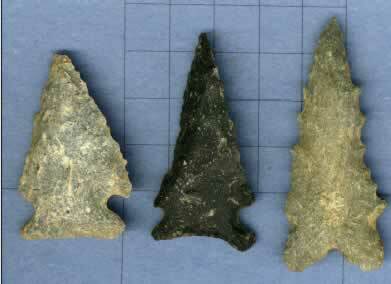 The Stallings and Thoms Creek pottery found at the Kolb Site are evidence of this. 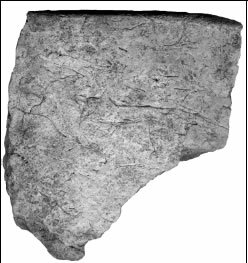 The earliest dates for pottery in North America have been found in the Savannah River Valley. Fiber tempered Stallings pottery was first made there about 4500 years ago and continued to be made for about 700 years. Unlike potters across the Atlantic, native Americans did not use potters’ wheels or kilns, even as late as the time of European contact. Their pottery was made by hand–molding and coiling the vessels–and fired in the open air. These techniques are still used by Native American potters in South Carolina today, making it our oldest continuously practiced indiginous craft. In addition to the first examples of pottery at the Kolb Site, we also find square stemmed Savannah River points, steatite pots and objects, and inland shell middens.